Mike Cianci tossed a perfect game Thursday to lead Mojave’s baseball team to a 3-0 home win over Del Sol. Cianci struck out 14 of the 21 batters he faced, including striking out the side in the second, fourth and sixth innings. He threw 62 of 78 pitches for strikes. Cianci also went 1-for-3 with a triple and two RBIs for the Rattlers. Kevin Gutierrez was 1-for-1 and scored twice for Mojave. 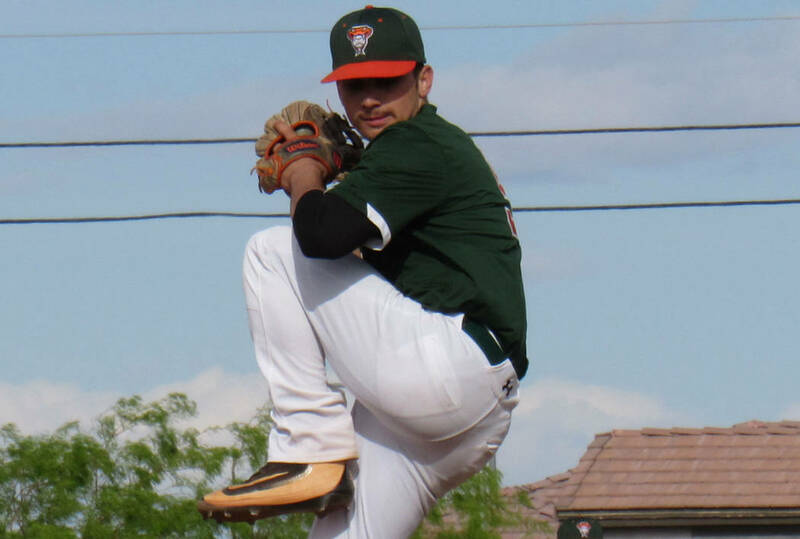 Palo Verde 5, Rancho 0 — At Rancho, Noah Carabajal scattered two hits and struck out four in 5 1/3 innings as the Panthers blanked the Rams. Peyton Cole went 3-for-4 with a double, triple and four RBIs, and PaulShawn Pasqualotto went 2-for-3 for the Panthers. Matthew Baughn went 2-for-3 for the Rams. Las Vegas 6, Centennial 3 — At Las Vegas High, Daniel Jimenez tossed five innings to earn the win, and supplied a solo home run as the Wildcats doubled up the Bulldogs. Trevor Johnson had two hits and two runs, and teammate Dalton Silet added two hits and two RBIs for Las Vegas. Rene Almarez had three hits and two runs to lead Centennial, which got two hits apiece from Kris Bow and Austin Kryszczuk. Arbor View 7, Cimarron-Memorial 5 — At Arbor View, Brennan Holligan allowed one run on seven hits and struck out five as the Aggies downed the Spartans. Jesse Pierce went 2-for-3 with a triple and three RBIs for the Aggies. Holligan also doubled for Arbor View. Zach Culver went 2-4 with a triple, and Jackson Folklman went 2-3 with a double for the Spartans, who scored four times in the seventh inning. Bonanza 5, Canyon Springs 2 — At Canyon Springs, Miguel Guzman-Sanchez was 1-for-1 with an RBI to help the Bengals top the Pioneers. Cayden Duncan scattered eight hits and struck out nine for Bonanza. Martin Blake was 2-for-4 with a triple, and Andres Dorado was 2-for-4 for Canyon Springs. Legacy 9, Eldorado 6 — At Eldorado, Fabian Torres was 2-for-4 with a double and an RBI to help the Longhorns down the Sundevils. Steven Tamborello was 2-for-3 with a double, and Zachary Chin went 2-for-4 with a double for Legacy. Julio Rodarte was 3-for-4 with a double and two RBIs for Eldorado. Western 6, Valley 4 — At Western, Emmanuel Moore went 2-for-2 with two RBIs as the Warriors defeated the Vikings. Gonzalo Lopez was 3-for-3, and Sebastian Reyes was 2-for-3 with a double for Western. Gary Bricker was 3-for-4 with a double and an RBI for Valley. Cheyenne 8, Desert Pines 0 — At Cheyenne, Angel Astorga tossed a two-hitter and struck out 14 to lead the Desert Shields by the Jaguars. Joseph Moreno was 2-for-3 with a triple and an RBI, and Guillermo Rodriguez was 2-for-4 with a double and an RBI for Cheyenne. Faith Lutheran 9, Shadow Ridge 0 — At Faith Lutheran, Michael Rice tossed a three-hitter and struck out six to lead the Crusaders by the Mustangs. Dylan Howell was 2-for-2 with an RBI, and Jacob Ortega was 2-for-3 with an RBI for Faith Lutheran. Pahrump Valley 16, Democracy Prep 0 — At Pahrump, Dylan Grossell singled and doubled, and Tyler Floyd had two singles to help the Trojans blank the Blue Knights in three innings. Cyle Havel belted a three-run home run for Pahrump. Zach Cuellar tossed a two-hitter for the Trojans. Laughlin 24-16, Mountain View 9-1 — At Laughlin, Tyreece Gonzalez had two three-run triples in the third inning of the opener as the Cougars swept two three-inning games from the Saints. Diego Trujillo went 2-for-3 with four runs and four RBIs in the opener for Laughlin. In the nightcap, Dann Perry tossed a one-hitter to complete the sweep. Trujillo was 2-for-3 with two RBIs for the Cougars. Eason Gregoire-Mazzocco went 2-for-2 with a triple and two RBIs in the first game for Mountain View. Pahrump Valley JV 4, Indian Springs 2 — At Indian Springs, the Trojans’ junior varsity scored four runs in the top of the sixth inning to down the Thunderbirds. Nathan Miller was 3-for-4 for Indian Springs.